Labyrinths are not to be confused with Mazes. While mazes are designed to trick you with dead ends and false paths, the labyrinth has only one path leading into the center and the same path leads back out. Mazes are games that cause you to get lost. 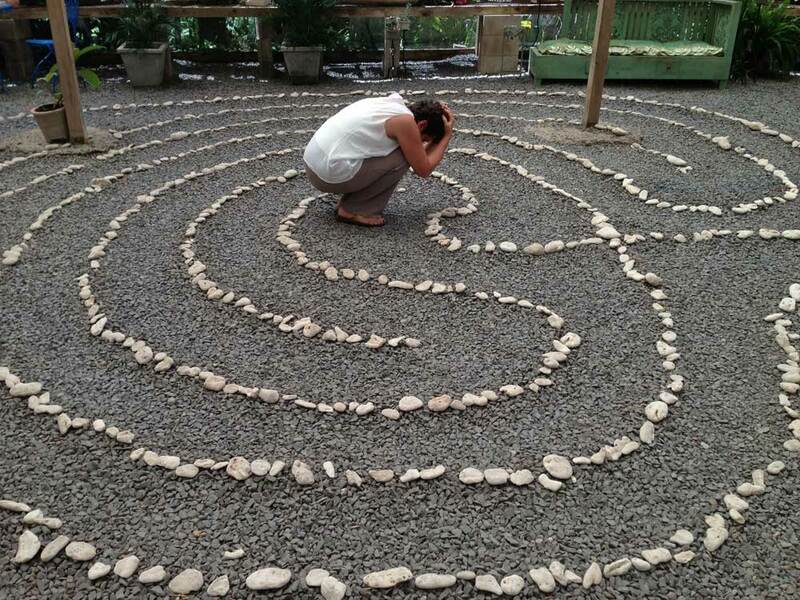 Labyrinths are paths of peace, prayer and contemplation and are designed to help you find your Self. 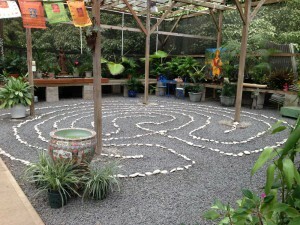 and • A classical 7-circuit labyrinth in the greenhouse. 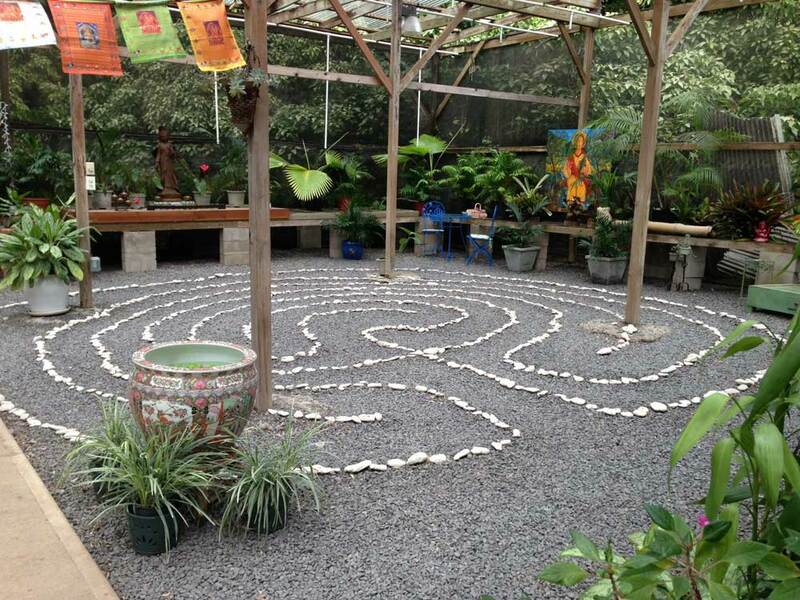 The labyrinths are free to walk daily (donations are gratefully accepted) and available during the nursery’s open hours (9am to 6pm daily). Modeled after the pattern of the Chartres Cathedral Labyrinth in France, this is an 11-circuit medieval labyrinth design with the alteration of an open heart in the center. Circuits refer to the number of times the path passes between the center and the outside edge. 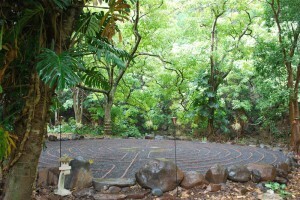 The labyrinth is an ancient path of pilgrimage, rich with meaning. Early in the 13th century, when the Crusades made journeying to sacred destinations too dangerous, if not impossible, would-be pilgrims got creative and used this beautiful path of prayer within the safety of the church. Within the labyrinth they could take a metaphorical pilgrimage. Since that time, the uses have expanded to include a path of self-discovery, healing, contemplation and revelation. Labyrinths have been found in multiple variations on the same theme — a single, winding path to a center point, which then returns to the outside — in many different cultures, some dating back four to five thousand years. The universal or classical labyrinth is simpler than the one at Chartres; typically, it has only seven circuits, or paths. In many cultures, it is also used as a walking meditation. Variations of the 7-circuit labyrinth has been found from England to India, South America to North America, and from Greece to Scandinavia. How this exact same pattern found its way throughout the world is a bit of a mystery. 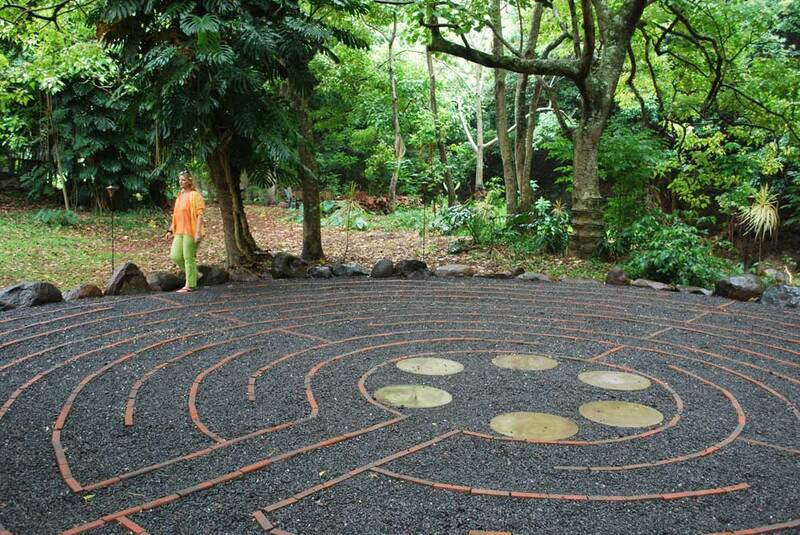 The walk into the labyrinth, is a time for contemplating your life and letting go of any inner obstacles you may encounter—stress, grief, thoughts, feelings, judgment, self-doubt—in preparation for reaching the center. Notice what you experience as this will be the very thing the labyrinth is teaching you. If what you discover about yourself serves you, great—do it with intention. However, if you find that the way you manuever through the labyrinth of life is not serving you, the labyrinth offers you an opportunity to experiment with new ways of going forth. 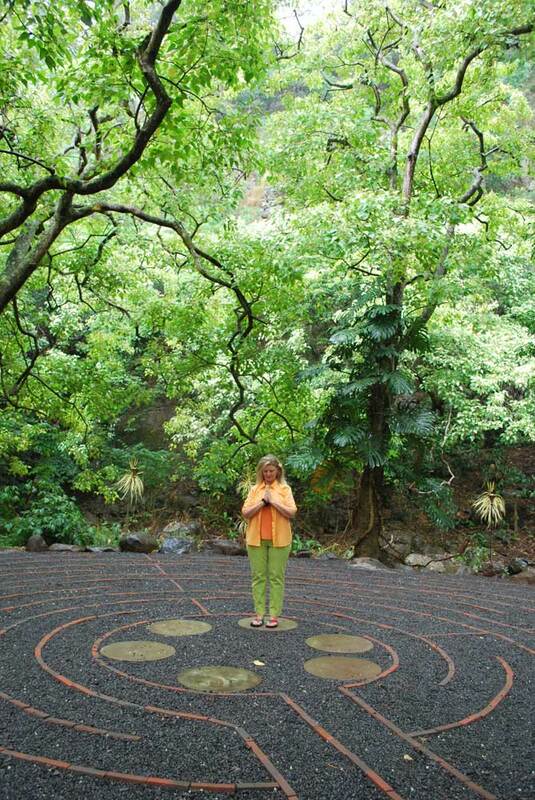 The center—the sacred destination is a time for silent meditation, contemplation and renewal. Stay in the center as long as you like, until you feel complete. The return journey back out—offers a time for integration in which we take the insights that we gained on the labyrinth into our lives for implementation. By applying them through aligned action, we are able to create transformation and bring about change. 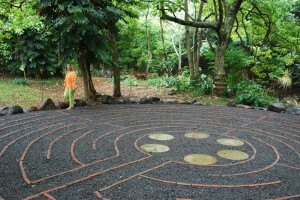 The magic of the labyrinth walk happens with METAPHOR. Be self-observant as you walk. The labyrinth will mirror to you what you need to see. Whatever you experience on the labyrinth will offer you insight as to what you need to pay attention to, and perhaps amend, in your life. You do not walk the labyrinth to learn about the labyrinth—you walk the labyrinth to learn about yourself. Everything is metaphor. Be self-observant. 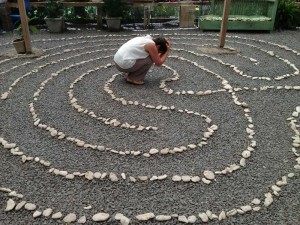 There are no rules for walking the labyrinth but there are helpful guidelines. 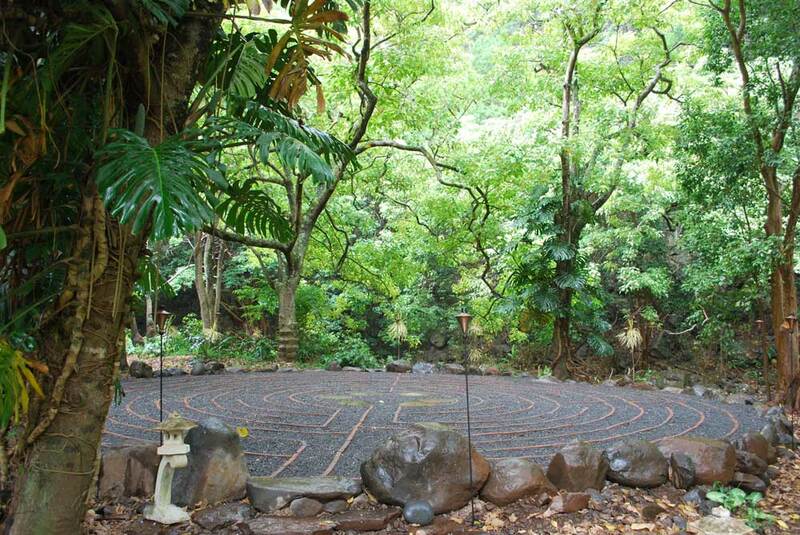 The Labyrinths at The Sacred Garden are open to the public, free, daily during open hours. Private labyrinth talks/walks with Eve Hogan can be scheduled by appointment for your retreat or group. 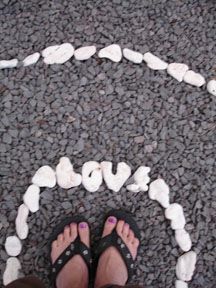 We offer Full Moon Labyrinth walks monthly.